Update, March 7, 2014: Improved shuffling has been rolled out on Spotify. More details at the Spotify Labs post, How to Shuffle Songs. Lots of users complain that Spotify's shuffle algorithms aren't really random. This can best be explained by a cognitive bias called the clustering illusion. Users aren't wrong to complain, though. What people want isn't true randomness, but an even distribution with separation of similar tracks. Dithering provides a visual analogy for the problem. Dithering is like a halftone pattern, used to create the illusion of continuous tones in a reduced-color image. Two particular methods of dithering are random diffusion and error diffusion. With random diffusion (top), pixels appear clustered together. 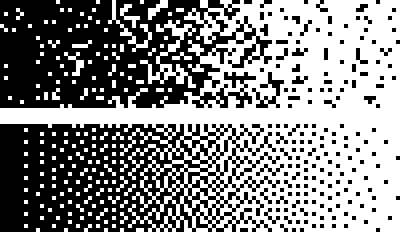 Error diffusion algorithms (bottom) take neighboring pixels into account and avoid clusters. In shuffling music, we seek to avoid the clusters in the same way. By the way, Apple got this right 9 years ago.